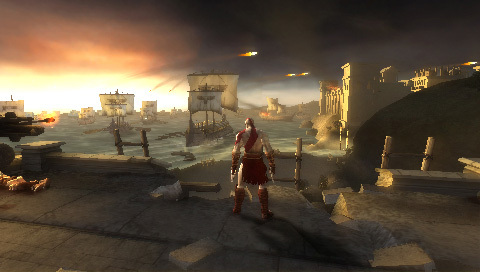 Kratos returns on the PSP with God of War: Chains of Olympus, a prequel to the successful games in the franchise. It doesn't stray too far from the expected formula and offers some intense battles, cool weapons and massive boss battles players have come to expect. It also looks beautiful with outstanding production values making this the most technically accomplished PSP games to date. Unfortunately, Kratos' latest quest isn't as deep as the console games, and it's a bit easier than you'd expect but it is still one of the best action titles for the handheld. Taking place before the events of the previous God of War titles, Chains of Olympus traces the rise of Kratos, the infamous Spartan Warrior as he battles an array of famous mythological beasts and bosses in service to the gods of ancient Greece. It's storyline is an intense tale of revenge and redemption, and the elaborate cut-scenes help to put you right into the action. The game doesn't fall too far from the successful formula and most players should be able to jump right in with little effort. It's controls and interface have been translated successfully to the PSP, with movement controlled using the analog controller, standard attacks using the face buttons while special moves use the shift keys. Chains of Olympus' learning curve is shallow, and this makes the game quite intuitive and the onscreen tutorials and messages will help novice players get up to speed. The action begins almost immediately and never lets up, making for an intense experience. You face your fist boss within a few minutes, and it's an epic encounter that sets the stage for the rest of the game. As you might expect from the previous games, Kratos is armed with his trademark chain weapons which he uses and swings to crush and pummel anyone or thing that gets in his way. These are powerful weapons, and they have multiple attacks, depending on whether the player is on the ground, or in the air. These allow you to take out any foes nearby while not letting them get close enough to you to inflict damage and feel fantastic in use, making combat a seamless experience where creating chain combo attacks that wipe out multiple foes immediately an almost effortless gameplay mechanic that feels very much like the console versions. His standard attacks are quite powerful, but in order to beat the many mythological creatures he faces, Kratos will need additional powers. When Kratos learns new skills, he can also unleash special magic attacks, which are usually earned after boss battles. Other upgrades can be earned as you collect gems and orbs from the ubiquitous crates and barrels. These are located in almost every corner of the game, and players shouldn't rush through and skip these, since every ounce of energy is needed for some of the boss battles. Kratos has a number of special attacks that can be used once his magic is enabled. Players can choose which of these attacks to equip from the main menu and some of these attacks are quite impressive, such as one where Kratos can call on the spirit of a fallen warlord who flattens and destroys anything within its radius. Players can also perform other tasks such as climbing on walls to traverse the game's difficult landscape. This varied moves and combo list challenges players to master multiple methods throughout the game, and helps to keep monotony from setting in. While there are a few push-overs, most of the enemies you face in Chains of Olympus put up a decent fight, but you'll also have to contend with other more advanced bosses and sub-bosses, with the furies, cerebus wolves and possessed soldiers offering quite a challenge. The game's liberal use of check-points makes it fairly easy to progress through the adventure. You can choose to play in bite size chunks going through a small level at a time, though it stands up well in extended play as well. This smart design makes for an excellent hand-held title that should satisfy fans of the series. 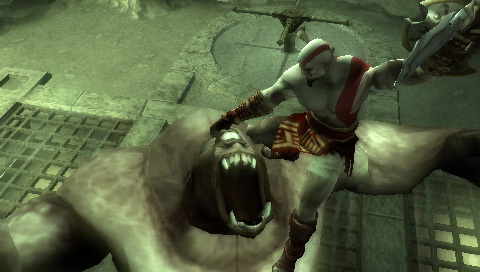 Another area where God of War: Chains of Olympus stays true to its roots are its quick-time response sequences, where players must press a series of buttons or perform circle motions with the d-pad in order to perform some truly spectacular finishing moves. These occur mostly with bosses, but there are a few racy sequences that this system is uses in as well. They tend to take the player out of the action a bit, but make a change of pace from the otherwise unrelenting action that can become a bit tedious after awhile It helps the storyline's pace and allows players to admire these multi-hit combos while not working too hard to achieve them. From a design standpoint, things have been kept simple. Most of the level layouts in Chains of Olympus are fairly straightforward hack and slash adventures, with a few crate-pushing and rotating pierces thrown in for good measure. Some of these are trickier and more complicated than you might expect, and require some weird moves, such as carrying the body of a dead soldier to hold a lever down, which is somewhat creepy but not out of the over-the-top God of War style. The gameplay itself is challenging depending on your level of difficulty. 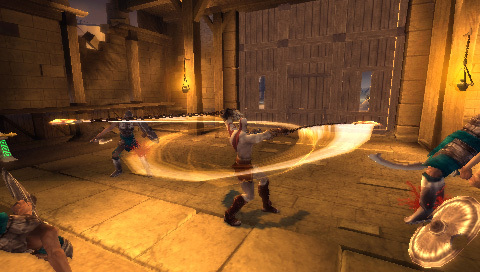 Most areas have multiple opponents attacking Kratos at the same time, which requires the player to perform an alternating pattern of blocking moves and power-attacks to defeat the enemies. The boss battles are epic in scale, especially when you face an enemy that's much larger than Kratos. You shouldn't be intimidated since he packs quite a punch for such a seemingly insignificant mortal. While the gameplay is solid, God of War: Chains of Olympus is also an impressive technical achievement, and pushes the PSP to new heights in terms of its slick production values and presentation. Most of the levels are pre-rendered which makes for some detailed areas, but the lack of a player-controlled camera makes certain areas a bit more oblique than they should have been, giving you a lack of direction as to what or where to do next. It might seem like a minor problem that doesn't occur often, but it can be very annoying when you can't figure out where to go next, which can be frustrating when it happens. This is the first title that uses the overclocking method on the console and it definitely shows in the game's beautifully rendered environments, rich character animations and elaborate cinematic sequences. Kratos' backstory unfolds through a series of intermissions, narrated and told as a fable. The standards set by previous installments are maintained with excellent voice acting and motion-capturing that brings the characters to life. An epic orchestrated soundtrack adds even more cinematic flair to the experience and gives Chains of Olympus an impressively polished feel. These elaborate production values might not have the same impact on the PSP's smaller screen as they would on a console, but the PSP is more than adequate to the task of bringing an epic-scale adventure to life in the palm of your hand. Despite all these positives, there are a few minor problems that make the experience less impressive than it could have been. God of War has always been designed with the solo player in mind, and while multiplayer or online options would have been a great idea, they weren't expected. While the levels themselves can seem long, the entire game is actually disappointingly short and veteran players should be able to run through the levels without much effort. Obviously, playing at a harder difficulty levels adds to the challenge and length, plus the developers have added side-quests and other secrets to help add some depth to the experience. However, the main game still feels like it ends just as it gets going, which is a somewhat disappointing given how much effort has gone into creating the title. Helping to mitigate these problems is the fact that God of War: Chains of Olympus creates an almost unmatched handheld experience, with outstanding gameplay highlighted by fluid controls, massive combos and some truly epic boss battles. The game's momentum drags a little here and there, but the pacing is generally excellent and offers a good mix of action and puzzle sequences. It's not flawless, but this handheld God of War delivers the intensity, challenge and entertainment players have come to expect from the series, making for a highly engrossing title that offers gamers a mostly satisfying experience that will leave you wanting more.